Last weekend Byron Bamboo and the Bamboo Society of Australia hosted a bamboo treatment workshop. Bamboo is fine strong material for construction but does need some kind of treatment to protect the timber against insect damage and infestation. The two most common treatments are probably solutions of borax and copper sulfate. Copper sulfate can be purchased on eBay or Amazon , and borax is available on eBay. The workshop, however, focused primarily on the Indonesian product Freemite. Freemite is an organic pesticide and termite treatment. It contains neem, borax, chilli, camphor, and a number of other plant extracts. The product developer, Theirry, gave a lengthy presentation about the product and how his team use it in Bali to treat bamboo poles on a large scale. 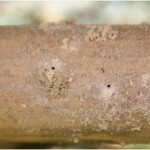 Solution left over after bamboo treatment is also used as insect spray and insecticide in the home and garden. At the workshop it became clear that here in Australia the choice of borax or copper sulfate varied. Participants seemed to agree though that the simplest method of infusion was by transpiration. Little equipment is needed, just a bucket really. 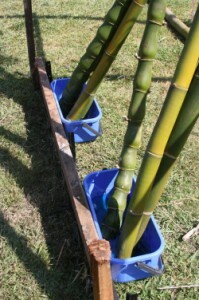 Freshly cut bamboo is placed upright in a bucket of the chosen solution and the natural actions of nature replace the sap with the treatment solution. Another method is the Boucherie method, where the sap in the bamboo is replaced by pressure. While not too complex, a special set up is needed. In Bali, the Freemite crew treat bamboo poles by submersing them in long, narrow concrete tanks filled with the Freemite solution. No experimentation seems to have been done there with the simple transpiration method. Perhaps because of the industrial scale of the operations in Bali. 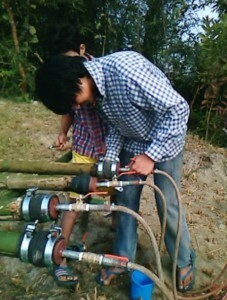 Some BSA members undertook to experiment with Freemite using the transpiration method. The resulting treated poles will be tested at the University of Technology, Sydney to establish how effective the transpiration method is using Freemite. Hopefully I’ll be able to share the results here in due course. This entry was posted in All, Building and Home Renovation, Food, Home and Health and tagged bamboo, bamboo treatment on 26/01/2015 by Deb. What were your results with Freemite?